When I see a book that I would like, either on Amazon or The Book Depository but don't *need* right away I tend to stick it in my shopping cart and wait for a special offer or discount code to come along in my inbox. That is what happened with this book, The Star Wars Craft Book. When I ordered it, I had full intentions of keeping it for Ebi-kun's birthday BUT (as my husband rightly said) Mommy couldn't wait that long! So we gave it to Ebi-kun as a graduation present. Ebi-kun has recently joined the millions of little (and big) boys who wants to be a Jedi knight when he grows up and spend half the day firing Star Wars questions at me, and although I enjoy the films, a walking Star Wars encyclopedia I am not. 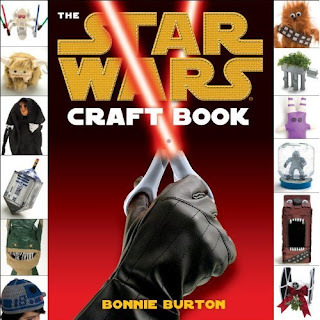 Anyway, back to the book, The Star Wars Craft Book, it is great! Although a lot of the projects can probably be found on the net, I still like the idea of having a book to flick through and of course that is easier for Ebi-kun too. There are over 40 projects covering all the films and many are adaptable so you could use the same technique but a different character. 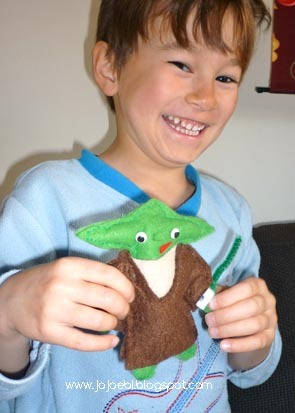 Ebi-kun decided he wanted to make a Yoda first, I cut out the felt but he did all the sewing and stuffing with the exception of the goggly eyes, it took him a couple of days but by the end he really had the hang of it and his stitched were small and neat. 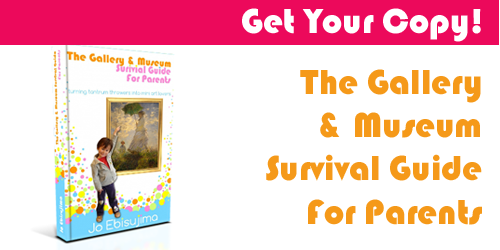 One thing I like about the book is that the finished projects are not 'adult perfect' if you know what I mean. As a kid, I used to love the TV programme Blue Peter, especially the crafty section but I would get frustrated because my 8 years old finished piece never looked like perfectly crafted adult version. The Yoda in the book, looks pretty much like Ebi-kun's finished version. Many of the projects are kid friendly, I would say most of them Ebi-kun and I will make together but I think an older child would be able to handle most of the projects by themselves. 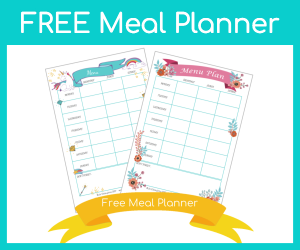 There is also a good mix of crafts, from simple sewing projects to paper mache to crochet. 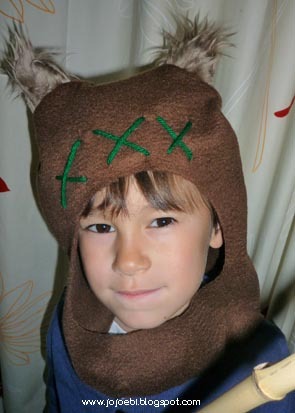 Ebi-kun also asked for an Ewok hat, this was so simple to make, I whipped it up as Ebi-kun was making Yoda's robe, luckily I had just enough brown fleece left to make the hood. It would be fun to make a pile of these for party favours, how cute would it be to see a load of Ewoks running around? I wanted to actually make a couple of projects before reviewing the book and I must say, we both love it. I think it would make a perfect present for any Star Wars loving crafty kids and adults alike. 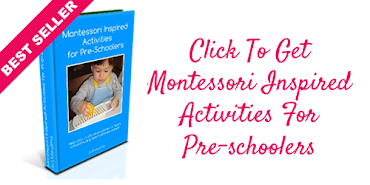 Ebi-kun says "It is a funny book with lots of good ideas. I want to make Emperor Appletine Doll next"